In several sets of experiments, PFC-funded researchers at JQI rapidly expanded the size of a doughnut-shaped cloud of atoms, taking snapshots during the process. The growth happens so fast that the cloud is left humming, and a related hum may have appeared on cosmic scales during the rapid expansion of the early universe—an epoch that cosmologists refer to as the period of inflation. The work brought together experts in atomic physics and gravity, and the authors say it is a testament to the versatility of the Bose-Einstein condensate (BEC)—an ultracold cloud of atoms that can be described as a single quantum object—as a platform for testing ideas from other areas of physics. The first and most direct analogy involves the way that waves travel through an expanding medium. Such a situation doesn’t arise often in physics, but it happened during inflation on a grand scale. During that expansion, space itself stretched any waves to much larger sizes and stole energy from them through a process known as Hubble friction. In one set of experiments, researchers spotted analogous features in their cloud of atoms. 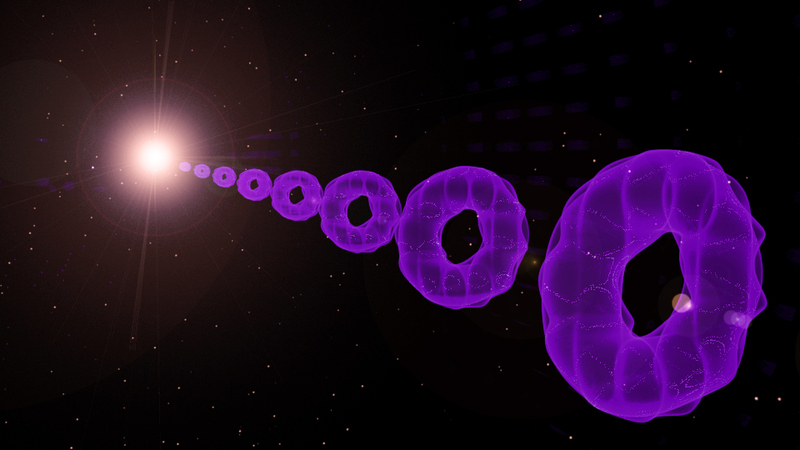 They imprinted a sound wave onto their cloud—alternating regions of more atoms and fewer atoms around the ring, like a wave in the early universe—and watched it disperse during expansion. Unsurprisingly, the sound wave stretched out, but its amplitude also decreased. The math revealed that this damping looked just like Hubble friction, and the behavior was captured well by calculations and numerical simulations. Future experiments may study the complicated transfer of energy during expansion more closely, or even search for further cosmological analogies.